The Maldives is a favourite among honeymooners and beach lovers alike. When looking at pictures of the atoll, it is pretty easy to understand why: white sand beaches, crystal clear waters and dreamy overwater bungalows are almost the norm here. The Maldives really is the epitome of an island paradise. However, the tiny islands are stretched for thousands of kilometres and not always easy to access. As inhabited islands are forbidden to tourists, resort islands also have undergone a significant hike in prices. With that in mind, is it even possible to find a great hotel in the Maldives? The answer is yes! To save you the trouble of looking for the perfect place for hours online, our team of travel experts have created this guide to the best hotels in the Maldives, plus we also have some more handy guides on; where to stay in the Maldives and things to do in the Maldives. Your dream vacation begins right now! Hurawalhi Island Resort is the best overall hotel in the Maldives. This incredible resort offers all-inclusive packages including meals at the world’s largest glass underwater restaurant. This is a once in a lifetime experience! All rooms include a private bathroom, air conditioning, a terrace or a patio, and a sea view. Overwater villas are available and have a private swimming pool. A delicious buffet breakfast is served every morning. The resort is adult only and provides transfers to the international airport for an additional charge. Kurumba Maldives is a top Maldives hotel and the best hotel in the Maldives near the airport. Guests have the choice between traditional hotel rooms or villas on the beach. Family rooms for up to two adults and two children are available. Each room at the Kurumba features air conditioning, a private bathroom with a bathtub, a terrace or a patio and a flat screen TV. Some of the rooms are located on the beachfront or poolside, and others have private swimming pools. The Somerset Inn Male is the nicest hotel in Male, the capital city of the Maldives. Located in the heart of the city, it is the perfect place to explore the only real town in the Maldives. Each room at the Somerset Inn is fitted with air conditioning, a private bathroom and a flat screen TV with satellite channels. Bathrobes and slippers are provided. A good breakfast buffet is served every morning and a free Wifi connection is available. The hotel features a fitness centre and provides a shuttle service to the airport. The Sheraton Maldives Full Moon Resort and Spa is one of the best luxury hotels in the Maldives and the best hotel for families. Bedrooms feature air conditioning, a private bathroom and a flat screen TV. Family rooms are available. The hotel also features kids’ outdoor play equipment, children’s movies and babysitting services. There are seven restaurants in the resort, each specialising in local, international or Asian cuisine. Activities on-site at the Sheraton Maldives Full Moon include cooking classes, snorkelling, diving, windsurfing, canoeing, tennis and pool tables. Kids can play the day at the kids club while parents relax at the pool. The Crown Beach Hotel Maldives is the best pet-friendly hotel in the Maldives. Located on a private beach, it offers a quiet environment ideal to spend a restful and relaxing holiday. Family rooms for up to four people are available. The rooms are spacious and comfortable and feature air conditioning, a private bathroom, a free Wifi connection and a wardrobe. Bottled water is provided for free every day, and a continental breakfast is served in the morning. Pets are allowed to stay at the hotel at no extra cost. Coco Villa Thoddoo is the best cheap hotel in the Maldives. The rooms are clean and cosy and feature a private balcony. Inside, they are fitted with a private bathroom, air conditioning, a seating area and a flat screen TV. Free toiletries are provided. The hotel features a private beach area and offers activities such as snorkelling, diving, water sports, bike hire, and fishing. There is also a badminton court and a library. Breakfast is served every morning either in the restaurant or directly in the room. The Hotel Jen Male Maldives is the best hotel to stay in the Maldives near Male, the capital city. The hotel features a stunning rooftop swimming pool overlooking the ocean, as well as a sun terrace. The hotel provides free transfers to the international via speedboat. The journey takes less than 10 minutes. The rooms are comfortable and decorated in a modern style. They all feature a private bathroom, air conditioning and a flat screen TV with satellite channels. COMO Cocoa Island is the best luxury hotel in the Maldives near Maafushi. Boasting a stunning private beach and overwater villas, the resort brings luxury to the next level. The luxurious suites on overwater villas include a sea view, air conditioning, an ensuite bathroom with a bathtub and a patio. The resort has a swimming pool located right on the beach, as well as a great fitness centre. A restaurant serving various international and Indian foods as well as a cocktail bar are to be found in the main area of the hotel. Veligandu Island Resort is a top Maldives hotel. The beach and water villas feature air conditioning, a private bathroom with a spa bath, a patio and an unobstructed sea view. During the day, guests can relax on the private beach, at the swimming pool side or in the resort garden. Alternatively, they can indulge in body treatments and massages at the spa or exercise in the fitness centre. All inclusive packages are offered to ensure you spend a stress-free holiday, where everything has already been taken care of. Ayada Maldives is one of the best luxury hotels in the Maldives. It is located on Vaadhoo Island, where the “sea of stars” can be observed at night from the beach. At the resort, guests have the choice between overwater villas, beach villas or garden villas with a private pool. All rooms feature air conditioning, an ensuite bathroom with a bathtub, a flat screen TV with satellite channels and a DVD player, as well as a terrace. All inclusive packages are available. Velassaru Maldives is one of the top 10 hotels in the Maldives and is located close to the capital city, Male. All the rooms are located either beachfront or directly on the water and boast amazing views over the ocean. They are fitted with a private bathroom containing free L’Occitane bath products, air conditioning, a flat screen TV and a DVD player. Some rooms also have a Nespresso coffee machine, a wine chiller and a private balcony. During the day, guests can enjoy the infinity pool and the fitness centre. Milaidhoo Island Maldives is surely one of the best luxury hotels in the Maldives. All villas are fitted with a private swimming pool, a spacious seating area, a terrace, air conditioning and an ensuite bathroom with a bathtub. All furniture is custom made and inspired by Maldivian architecture. A bottle of champagne and a fruit basket is offered upon arrival, and guests can make use of the resort’s private lounge at Male International airport. A tasty breakfast is served at the Milaidhoo every morning, and a 24-hour host is available to assist guests. Sun Island Resort is a top Maldives hotel. All rooms include air conditioning, an ensuite bathroom, a private terrace and a flat screen TV with satellite and kids channels. The resort is non-smoking. An indoor and an outdoor kids play area is located in the common areas of the hotel, and board games, puzzles and DVDs can be borrowed for free. Babysitting services are available for an extra fee. Adults can relax at the spa while getting a massage or beauty treatment. Meeru Island Resort is one of the nicest hotels in the Maldives. Located on a private beach, it also boasts a stunning swimming pool for guests to enjoy the sun and the water. Alternatively, guests can enjoy activities such as a fitness centre, a wellness centre, snorkelling, diving, badminton, tennis, karaoke and windsurfing. The reception provides a bicycle hire service. All rooms feature air conditioning and a private bathroom. All inclusive packages including all meals are available. The Shangri-La Villingili Resort and Spa is one of the great hotels in the Maldives. Located on a white sand beach and over pristine water, it provides an idyllic environment for a successful beach holiday. The resort is equipped with a private 9-hole golf course, an infinity swimming pool and a spa. The property is surrounded by lush, tropical greenery. The rooms feature a private bathroom and air conditioning, as well as a seating area. Three restaurants are available on site for guests to enjoy a meal after a long day exploring the Maldives in the sun. 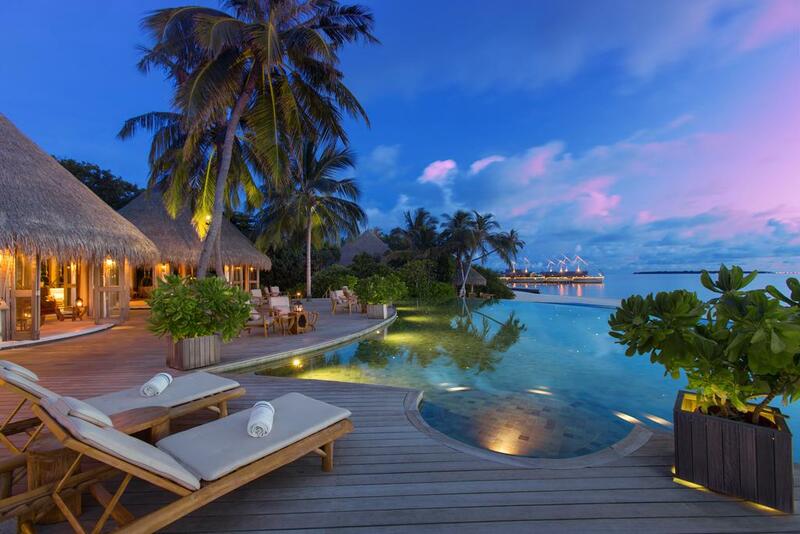 The Kuredu Island Resort and Spa is a top rated hotel in the Maldives. Its 4-star accommodation offers spacious, comfortable rooms featuring a private bathroom, air conditioning, a private patio and a tea and coffee maker. While staying at the resort, guests can indulge in canoeing, snorkelling, fishing and golfing. Free Wifi is available all around the property. Seven different restaurants are located on-site, serving different cuisines from around the world. A good buffet breakfast is served every morning. Amazing View Guest House is one of the best cheap hotels in the Maldives. The rooms are clean and comfortable and feature air conditioning and a private bathroom. Some of the rooms have a garden view and free wifi is available everywhere in the hotel. The friendly staff are available on call at any time of the day or the night. Airport shuttle services are provided. The Banyan Tree Vabbinfaru is located on a small private island in the Maldives. It offers spacious villas with a private swimming pool, an ensuite bathroom, air conditioning and a free Wifi connection. Each villa has a panoramic view over the ocean and a sun deck to relax on. The on-site spa offers massages, beauty treatments, facial treatments, manicures and a steam room. Up to two children can stay for free in the room of two paying adults. Our trip through the beautiful islands of the Maldives has now come to an end. We hope you have found something to suit your taste and your needs, whether you are looking for decadent luxury or an affordable guesthouse with a family feel. If you are not quite sure yet, we cannot recommend Hurawhali Island Resort enough. The rooms are stunning, and the underwater glass restaurant is the unique feature of a once in a lifetime experience. If you have found another stunning property we have not mentioned in this guide, let us know in the comments! We’ll be happy to add it on for other travellers to enjoy. Did you enjoy this article? Here are some other articles written by our travel experts that will help save you time and money for the trip of your lifetime!